Magdalena is inspired by “Globe Gothic” design yet features different proportions, curves, serif shapes and contrast, which give it a classy, playful and a more contemporary look. The family comes in two versions: an elegant font of 8 weights-ranging from Thin to Black-with matching italics, and an alternate, more playful counterpart with the same number of weights and italics. The whole Magdalena set contains 566 characters which support over 200 Latin-based languages. 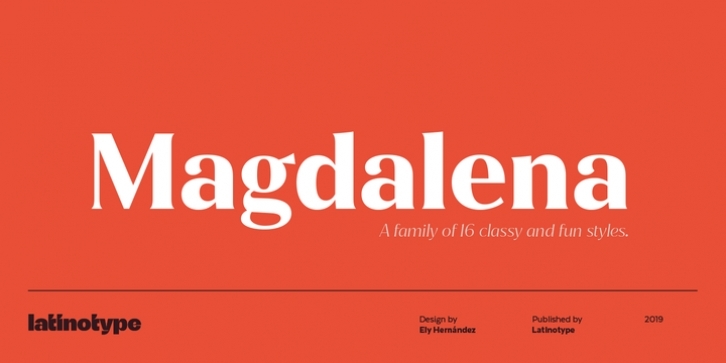 Magdalena is ideal for magazines, short text, logos, branding design, packaging and advertising.